As parents we like being able to spend time with our children, specially the littlest ones. I guess it’s just human nature. Among these special times are mealtimes when everyone gets together. The best booster seats for eating allows baby to join the rest of the family at the table. This way mom or dad can tend to them and still be with the rest of the clan to enjoy their company and conversation. Today’s booster seats come in a lot of different varieties. Our reviews below explain which of the items are worth considering if you’re looking for a baby booster seat. This is the basic booster seat model from Fisher Price. It is very affordable and comes with all the basic features you want for feeding the little one. Fisher Price does have a Deluxe model that includes a few extras which is our top pick below. This unit is designed to support children up to 50 lbs. in weight. They make feeding and eating with the little one more convenient, not to mention safe. Constructed with heavy duty plastic is can be used with or without the tray as you child grown. The unit comes with seat harness to keep baby secure during feeding time. The bottom also includes a chair strap that makes it easy to tie the booster to a standard table chair during meals. The surfaces of the seat as well as the tray as designed to be easy to wipe for cleaning. The included feeding tray is dishwasher safe to make things more convenient as well. For Bigger Kids; Very Portable: If you’re looking for something that’s designed for a slightly older child, this one is one of the top choices to get. This unit is built for kids who are 3 years old and above and has a 70 lb. weight limit. The unit is different from the other products in our review here as it doesn’t come with the tray, safety harness or baby seat. It also comes with a wide, thick cushion that’s very comfortable for your childe to sit on. This is something that the others often don’t have. One of its best features is its portability. The unit’s backrest can be folded over the cushion. All you need to do is press the button at the back. This allows the back rest to collapse and fold down. In this form, it makes it very easy to carry the device with you when you go to the grandparents’ place or out to eat. The large cushion is also removable, so you can give it a thorough cleaning. At the bottom of the seat is as non-slip cutouts that ensure that the device stays in place when set over a chair. This keeps baby safe so they don’t slide back and forth and hit the table during meal time. Best Booster Seat: This is the deluxe version of the Fisher Price booster seat featured earlier in our review. This unit is very similar to that one being made by the same manufacturer. However it does come with more color/design options as well as features. It does cost a bit more, but at less than $10 extra we feel this provides more value for your money. This gives you the option of getting that one for baby that also fits your home’s interior design. While it does look very similar to the standard Fisher Price booster above it does come with a few extras which is why we rank it as the top in our best booster seats for eating reviews. It comes with a tray that’s removable and can be snapped on. It also has a snap on lid for the tray to keep the tray clean during transport to ensure the tray is clean at all times. The standard booster seat model from Fisher Price at the top of our review doesn’t have these 3 items. The extra tray components are all machine washable for convenience. Very affordable, this is one of our favorites as it offers the traditional baby booster seat for eating and feeding plus some extras. The unit works as a 2 in 1 seat. 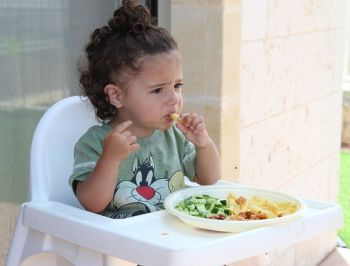 During baby’s earlier stages, it is used as a feeding seat along with the tray. As they get older, it turns into a toddler seat by discarding the tray. This allows them to join the grownups eating at the table. The unit lets you adjust to 2 height positions. This makes it accommodate for your baby’s growth. It also comes with a 3 point harness that ensures safety and security when baby is in it. The chair straps, to the back as well as at the bottom, also make sure that it device is fastened securely to the dining table chair. Grows with Your Child: This is a convertible unit that transforms between 3 different types of seat. Each of the seats are suited for certain ages so they can feel comfortable during meals and feeding time. Stage 1: uses the seat with the positioner. The positioner is a small gray seat that’s removable. It fits into the booster seat to prop up baby. But more importantly helps keep baby upright thanks to the molding as well as the foam insert. This allows baby to sit upright easily. Stage 2: as baby grows, their muscles also get stronger allowing them to sit in the booster seat with the positioner, but not needing the foam insert anymore. The unit also comes with straps that allow you to secure it to a chair. At this point you can add in the tray as well. Stage 3: is the last stage when baby doesn’t need to the positioner nor that tray anymore. All that’s left is just the standalone booster seat as they are able to sit upright on their own during meal time. The variability of the device makes it very versatile and also allows you to extend its use. It is designed for kids from 4 months old all the way up to 4 years of age. Among the best booster seats for eating above are those that help baby enjoy meals with the rest of the family. These products also have the capability of growing with your child so that they last more than just one or two years. This way you get the best value for your investment.